granny in space, what’s it to live 10 times longer than supposed? 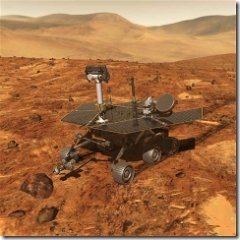 Do you remember the landing of the two mars exploration vehicles calles Spirit and Opportunity in 2004? Well I think you do. They were built to last 90 days. But it’s now more than 1000 days – more than 10 times the timespan. Well well, the two sneaky space travellers are kind of tattered – ones wheel isn’t working anymore and the other one had to get his brain “reformated” several times…but all over all they are in good shape for very old fellas.